Digital Identity – who are you? Identity: fluid, constructed, and open to interpretation. While our F2F identity changes, it’s interesting to see how our virtual identity also changes with age. I remember the ages of AOL instant messenger, Myspace, and flip phones with tiny screens for photos. So much has changed in such a short amount of time. How do digital trends survive across time – what attracts people, and what makes them lose interest all at the same time? My digital identity has also evolved with my F2F identity. With technology, there’s a lot of chatter about millennials and their ability to have a strong digital connection. This caused me to re-examine these categorized “generations” because I wasn’t exactly sure where I fit; enter Google search “what years are associated with millennials” and bing – PEW article. Ugh. What am I? Where do I fit? My first thought – that’s a large range! I keep reading. I received my first laptop at 18 – and I was one of the few kids that had a device. Check – that fits Gen X. Latchkey kid from a divorced family. Check for Gen X! I suddenly wanted to know more about Gen X – enter second Google Search – and 2nd PEW article . Article title, “Generation X: America’s neglected ‘middle child’ “. Hmm. The article seems to point out that the Boomers and the Millennials are much more defined in terms of their characteristics, and therefore the term “middle child”. I’ll keep being my Gen X self with a twinge of Millennial. Perhaps factors other than my age make me feel, at times, more millennial in terms of technology. Teaching keeps you young and current as you keep up with the Kids (Kardashians) and also use technology in the classroom. 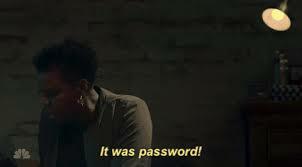 Let’s be clear though: remembering passwords does not count. As you start to dip into at the end of your post, I think that there are a lot of factors that go into our identity and our digital identities. It is fun to look at the larger trends and think about how we fit or don’t fit into them and I do think that the larger studies that are based on age can be of value for reflecting sociologically. I do worry, however, that too often we let these “trends” define us or define others around us.